In a homily delivered in Lourdes on the Day for Life, the day on which the Church celebrates and affirms life from conception to its natural end, Cardinal Vincent said that we should both cherish life and embrace natural death. In its 26th year, the Westminster pilgrimage to Lourdes takes place from Monday 27 July to Friday 31 July. 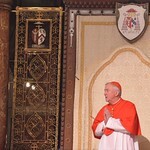 The full text of the Cardinal homily can be found here.